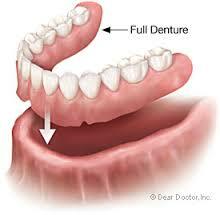 A denture is a removable replacement for missing teeth and surrounding tissue. There are two types of dentures – complete and partial. Complete Dentures are a replacement for missing teeth and surrounding teeth. Complete dentures replace all teeth and are usually recommended as a last resort. A complete denture will give you back the look of your teeth but will change the way your mouth functions. Because of the shape and materials used to fit a denture, chewing capacity and taste change dramatically. Your mouth will also change shape and shift over time causing a need for refitting a denture. If other cosmetic options are available we strongly encourage such options above a complete denture. 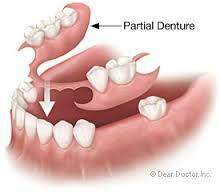 Partial Dentures are considered when some of your natural teeth remain. A partial denture can be done in a variety of ways and options: from metal base to flex acrylic base, to snap in onto natural tooth or implant, to full implant retained. These are much more preferred than complete dentures but taste is still reduced. Not sure what treatment option is right for you? Schedule your free consultation here to meet with Dr. Harmon and get started on a happy, healthy smile.